For years, people have relied on roads as a means of transport for the safe and reliable movement of people and goods. However, there are still many roads across the world which are dangerous for people to travel across- especially in remote places. 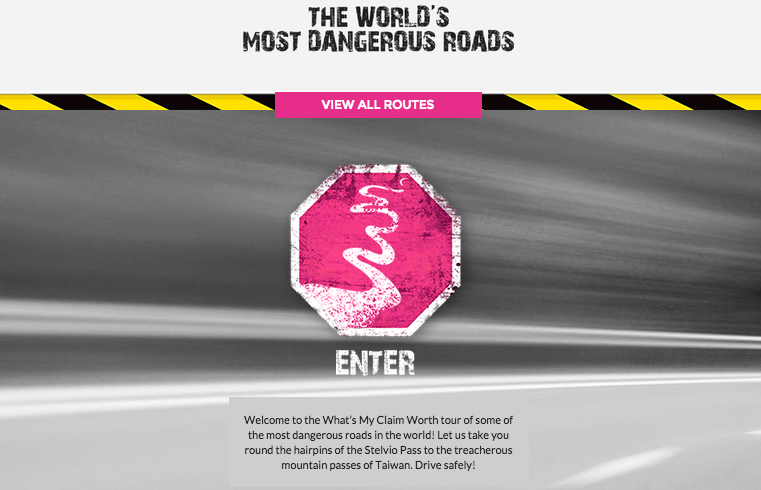 We have created an interactive feature on a collection of the World’s Most Dangerous Roads and here is our pick of the top 10. The Going-to-the-Sun-Road is 50 miles long and considered one of the most scenic drives in the USA. However, due to it’s tight and narrow bends, it has built a reputation for being one of the most dangerous ones. Parts of the road are not protected by guard rails and is closed during winter months due to snow and the risk of avalanches. The Transfagarasan Highway is one of the highest roads which is found in Romania. Although it’s well known as one of the most stunning roads in the world, it’s also one of the most dangerous due to its hidden twists and turns, it’s steep descent and sharp hairpin bends. The Italian road was built in 1917 and is 6,555 metres long and offers 52 different rock galleries. It offers stunning views of Italy and is made of narrow tunnels and sheer cliff edges. There has been a number of fatal road accidents on this stretch of road and the narrowest section was originally built for two mules with baggage. The A537 found in the Peak District, is one of the most dangerous roads in England. It’s often referred to as the “Widow-Maker” due to it’s fatality number. The road is surrounded by dry stone walls and rocks, while the road itself offers uphill climbs, tight bends and steep falls. The speed limit on this 8 mile road has been reduced and often has a police presence to encourage people to slow down. This dangerous, curvy mountain road found in Applecross, Peninsula Highland. The road is made up of very tight hairpin bends that switch back and forth up the hillside with gradients approaching 20%. It’s often compared to the the roads on the Alps. At some points of the road, it becomes so narrow that there are several stopping places for vehicles to stop for oncoming traffic. One of the most famous balcony roads in France, the D219, is 9.9km and is deemed as one of the scariest roads in Europe. At no point is it possible for two cars to pass at the same time due to the narrowness of it. At either side of the road, there are cliff drops with no guardrails and drivers will encounter 9 hairpin bends and 3 tunnels. This 414 mile dirt road from Fairbanks to the North Slope of Alaska is mainly used by oil and gas truckers. The highway twists and winds around steep mountains. A helicopter checks the road twice a day looking for accidents or breakdowns as the area has no phone signal, no service stations and only one petrol station. Located in Norway, the atlantic ocean road is 5.1miles long and has eight bridges on it. It’s a great tourist attraction which offers up some of the most beautiful scenery. The curvy road dips and arches across the Norwegian Sea waves- which often rise over the road during storms. The Taroko Gorge is one of the most dangerous roads in the world and is carved out from the mountain face. The road is made up of blind corners, narrow sections and huge drops alongside it. Patiopoulo-Perdikaki is a narrow stretch of dirt road with dangerous slopes on either side of it. There are multiple deaths recorded each year on this road as the road has no guardrails and it’s unmarked making it difficult for drivers to judge the distance from the edge.